Ronnie Hawkins was born in Huntsville, Arkansas, on January 10, 1935, two days after Elvis Presley. Hawkins' mother was a teacher; his father, a barber. Known affectionately over the years as "Mr. Dynamo," "Sir Ronnie," "Rompin' Ronnie," and "The Hawk," Hawkins' love of music started in high school. He formed the first version of his band The Hawks while studying at the University of Arkansas in the 1950s. In 1958, on the recommendation of Conway Twitty – who considered Canada to be the promised land for a rock'n roll singer – Hawkins came to Hamilton, Ontario to play a club called The Grange. He never left. Adopting Canada as his home, Hawkins became a permanent resident in 1964. Over the years, Hawkins gained recognition for recruiting and grooming outstanding Canadian talent. The membership of his band, The Hawks, kept changing as the talent flowed in and out, but the name stayed the same. One edition of The Hawks (with Canadians Richard Manuel, Garth Hudson, Rick Danko, and drummer Levon Helm) moved on to become Bob Dylan's backup band and later achieved superstardom as The Band. Another incarnation became Janis Joplin's Full Tilt Boogie Band, and another Robbie Lane and the Disciples. Other famous Hawk alumni include David Clayton Thomas of Blood Sweat and Tears, actor Beverly D'Angelo, musician Lawrence Gowan, and fellow Canadian Music Hall of Fame inductees Burton Cummings and David Foster. Hawkins has befriended many of the music industry's greats. At the height of the 1960s peace movement, Hawkins invited John Lennon and Yoko Ono to his Ontario farm to plan a peace festival during the couple's peace crusade. He also accompanied them on the train to Ottawa for their famous visit with Prime Minister Trudeau. Hawkins later toured the world at Lennon's request as a peace emissary for Lennon's "Love Not War" message. In 1989, Ronnie was reunited with The Band at the concert marking the destruction of the Berlin Wall. In 1992, he performed at the inaugural party of former President Bill Clinton, one of The Hawks' biggest fans. 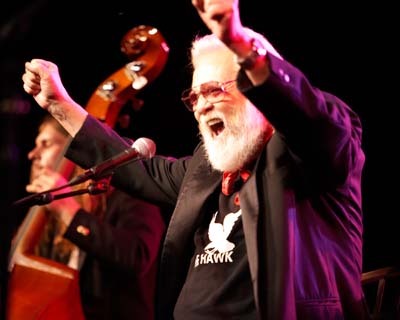 Hawkins has also performed for every Canadian prime minister since John Diefenbaker and even played for Solidarity Leader and former president of Poland, Lech Walesa. Hawkins won a Juno for best Country Male Vocalist in 1984 for his hit, “Making It Again”. Eight years later he received another Juno nomination for "Let it Rock". In 1996, the Canadian Academy of Recording Arts and Sciences honored him with the Walt Grealis Special Achievement award for his contribution to developing Canada's music industry. Ronnie Hawkins is also an accomplished television and film actor. He's hosted his own television show and made guest appearances on television variety shows and on many Canadian dramatic and comedy series. Hawkins has also performed in a handful of films including, The Last Waltz (with The Band), Heaven's Gate (with Kris Kristofferson), Renaldo & Clara (which Bob Dylan produced), and One More Time (with the late greats, John Candy and Dean Martin). Ronnie Hawkins released his 27th album Still Cruisin' in Canada in 2002. Hawkins currently has a promotional relationship with Cambria, a Minnesota based company specializing in the production of quartz surfaces. As a spokesperson for Cambria, Ronnie will perform at the grand opening of their first fabrication facility in Canada on August 18th in Bolton, Ontario. In November 2007, Ronnie was honored with the Special Achievement Award at the Society of Composers, Authors and Music Publishers (SOCAN) Awards. This award is given to individuals who have greatly contributed to Canada’s music industry over the course of their careers.